As a part of the Karnataka Subject Teacher Forum program, working with teachers, ITfC developed OER for high school subjects in English and in Kannada. Since OER in Hindi will be required for teachers from the northern part of India, ITfC team worked with translation experts to develop key OER in Hindi. This included participating in developing Hindi language interface for the FOSS applications used in our work, such as Geogebra, Firefox, LibreOffice Writer etc. 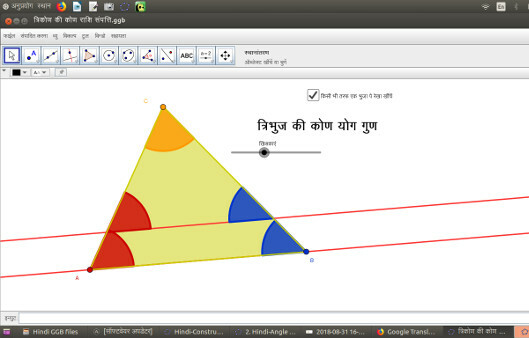 A second part was in translating Geogebra files to Hindi. A third part was in translating the simple user manuals for the FOSS applications developed and published as 'Explore an application' in English and Kannada, to Hindi. This project is a long term one, lot of work is required to develop adequate OER in Hindi and other Indian languages, the journey has begun.